Israeli Prime Minister Benjamin Netanyahu visited a construction site in East Jerusalem on Monday, a day before legislative elections. Israeli Prime Minister Benjamin Netanyahu visited a construction site in East Jerusalem on Monday, a day ahead of legislative elections. There are two phases to the Israeli election that starts Tuesday. The first: electing some politicians. That’s the relatively easy part to forecast. The second: Figuring out who’s going to govern with whom. That is what’s really hard to predict. In the first phase, no party is likely to win a majority of the 120 seats in the Knesset, the country’s parliament. But the two main parties are still jostling to hold the most seats. Likud, the party of Prime Minister Benjamin Netanyahu, is in a tight race for the most seats against the Zionist Union, the center-left leading opposition party. Based on a local regression of polls since January, it looks like the Zionist Union will win the most seats: about 25, to Likud’s 22. In the following table, we’ve placed confidence intervals around the individual party estimates1 based on poll performance in the prior two elections. Predicting the voting may be the easier part, but it’s not easy. This year, Israeli law restricted polling as of the Thursday before the election, and no pollster could release results of new polls after Friday. That leaves any shifts in public opinion that occurs over the weekend in pollsters’ blind spot, especially because some parties and candidates save big ammunition for the final days before balloting. Just before the 2013 election, a video emerged in which a candidate for Bayit Yehudi, a right-wing religious party whose name means Jewish Home, speaks about the prospect of the mosque on Jerusalem’s Temple Mount being blown up. (Some people interpreted the remarks as support for the idea.) The resulting furor over what the candidate called a joke cost the party seats — including that candidate’s. The major potentially vote-shifting news Monday was Netanyahu’s pledge to oppose establishment of a Palestinian state. Israeli pollsters have had large misses in previous general elections. In 2013, for instance, the centrist, secular Yesh Atid party never polled above 13 seats but won 19. With 11 parties likely to win seats Tuesday, there’s a good chance that at least one will fall outside of our 95 percent confidence range. Likud might even win a plurality. Since no party will come anywhere near a majority in the first phase, party leaders will choose whom to back for government leader. 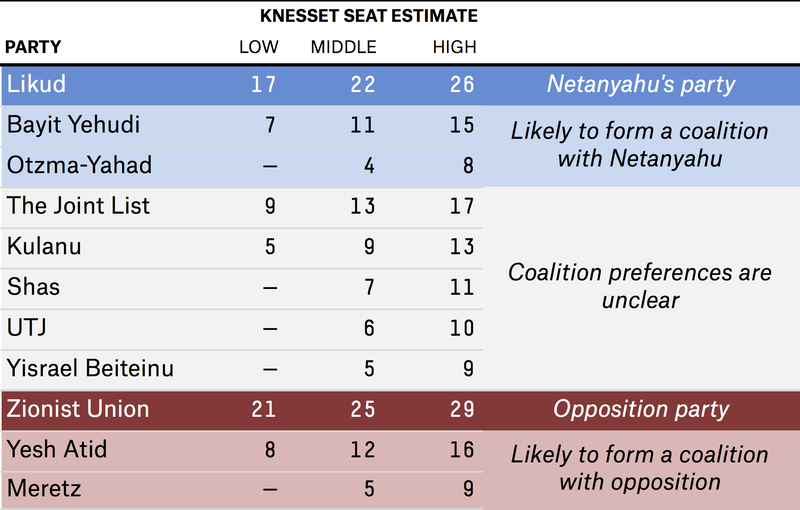 In the table above, we have color-coded the parties that most forecasters agree will back Netanyahu in blue and those that probably will back his opposition in red. The parties that are toughest to call are in white. The anti-Netanyahu bloc is closer to a 61-seat majority than Netanyahu is. Even in 2013, when Netanyahu was the clear front-runner, nearly two months elapsed between the January vote and the formation of a coalition government. “It’s very complicated,” Saltan said in a telephone interview. Saltan and other election analysts in Israel who have been watching every poll for months generally are loath to predict exactly how coalition building will go. Saltan’s projection of the anti-Netanyahu bloc — the Zionist Union, Yesh Atid, the Joint (Arab) List alliance of Arab-dominated parties, and left-wing Meretz, which together only total 55 seats by our estimate — consists of parties that aren’t all united behind Zionist Union candidate Isaac Herzog. “There are three other [parties] besides Herzog’s party, and each one brings problems where it’s hard to go ahead and create a situation that brings everyone in,” Saltan said. In his final forecast, Saltan outlined scenarios in which either Netanyahu or Herzog build governing coalitions. The swing vote, in his analysis, could come from Kulanu, a party characterized by its progressive economic ideology. Forecasts don’t all agree on how the parties will line up. While Saltan counts four parties that have ruled out sitting with Netanyahu, election forecaster Nehemia Gershuni-Aylho said in an email interview that he counts only two: Joint (Arab) List and Meretz. Meanwhile, the pair of anonymous analysts behind the forecasting site Batelbe602 divide parties into three blocs — right, left and centrist-religious — and let users drag and drop parties into their own imagined coalitions. It’s a trade machine for the political set. Phase two will get even more difficult to predict if it turns out that the polls missed phase one badly. The polls are stale enough to leave room for a major change before Tuesday, which could shift parties’ power heading into coalition negotiations. The polls could be flawed in addition to outdated. Saltan said that private campaign polling in Israel tends to be better than the publicly released polling, which can vary widely by how people are polled — by landline, cellphone or Internet. Relying too much on any method risks missing parts of the electorate. Batelbe60 has identified what looks like “herding” in the Israeli polls, a phenomenon we’ve spotted in U.S. electoral polls. The polls nonetheless did pretty well in the last two elections. In 2013, Saltan’s model predicted seat counts within one seat of the correct number for most parties. CORRECTION (March 16, 6:24 p.m.): An earlier version of this article incorrectly stated that no party is likely to win a plurality of the 120 seats in the Knesset. No party is likely to win a majority of the seats. These are 95 percent confidence intervals. Because of rounding, the total is 119 seats. Parties that get at least 3.25 percent of the vote are assigned a number of seats proportional to their number of votes. Candidates take seats in the Knesset based on their order on their parties’ lists and how many seats their parties won.